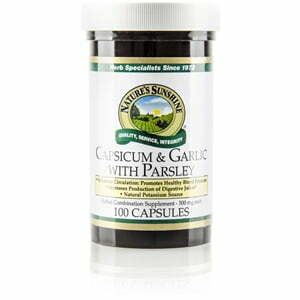 Nature’s Sunshine combines capsicum, garlic, and parsley to provide a rich source of trace minerals. 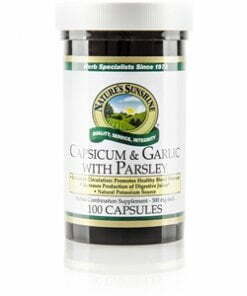 Capsicum works to support the digestive system while garlic provides immune system support. Both offer nutrients that are key in enhancing circulatory health. The addition of parsley to the formula helps to regulate the garlic odor. These three herbs work together in Nature’s Sunshine Capsicum & Garlic with Parsley to regulate already normal levels of blood pressure. Instructions: Take two capsules with food three times daily.